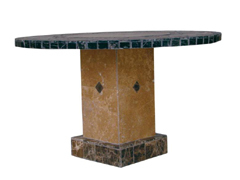 Below you will find our selection of natural stone table bases. The pictures below represent the shape design of the various bases that we offer. Any of these shape designs can be crafted from a matched mosaic stone pattern to sync up with any of the table tops offered on this site. 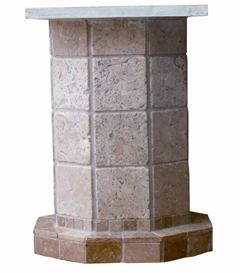 Important sizing information - Please note that regular stone table bases are only suitable for table tops which are under 50" in diameter. If you have a table top which is larger than 50" in diameter you will have to purchase an oversized table base to accomodate it. If you choose a table top which is an oval or rectangle, larger than 42" X 76" you will have to choose either the Roma Oval or the set of 2 Pompei bases to accomodate this table size. 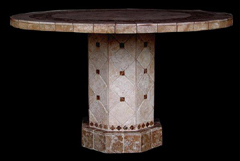 Customized to match the stone and mosaic pattern of the table top you select. 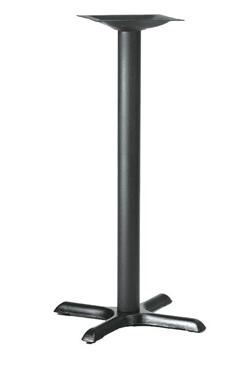 Click Here to see more examples of this table base. 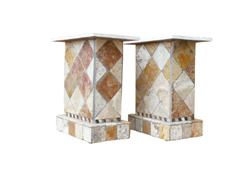 Sized to match stone table tops ranging from 30" to 54" in size. 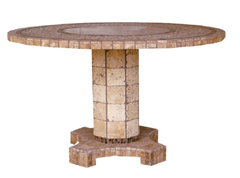 Click here for our full collection of stone tables tops that can be matched with this base.